Cultilene supplies stone wool substrate solutions and Albarino diffused glass in more than 50 countries worldwide. The company is part of Saint-Gobain, a leading global supplier in the habitat and construction market, is represented in 67 countries and has more than 170,000 employees. Using real-time sensory data from 30MHz, Cultilene can now offer agronomists an additional tool to optimise their irrigation and EC management, taking production and crop quality to the next level. 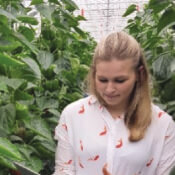 A custom online dashboard was developed to help Cultilene drive growers’ success beyond offering the best substrate solutions for contemporary horticulture. The company wants to support growers in optimising their growing strategy, and recognizes that maintaining a healthy root environment —which affects water and nutrition absorption— is crucial to this success. Cultilene recommends continuously monitoring five key metrics (“the Big Five”) during cultivation: soil moisture level, EC, pH, oxygen and temperature. This partnership brings together Cultilene’s 35 years of expertise in rootzone management and the real-time data captured by 30MHz wireless sensing technology, augmenting decision-making capabilities for growers. The 30MHz ZENSIE dashboards provides an intuitive way to visualize sensor data alongside other data sources, including climate computers and loggers.